Second ESE Printer installed this week, another to install next week. US-2000X with optional vacuum tooling for thin and warped PCB's. Application for LED Lighting assemblies and Lighting drivers. Well known lighting manufacturer spent several months studying different screen printers and after careful consideration chose the ESE US-2000X. Programming a new board is fast and can be done in just 5 minutes. 2D inspection system is not only fast but set up fairly simple too. 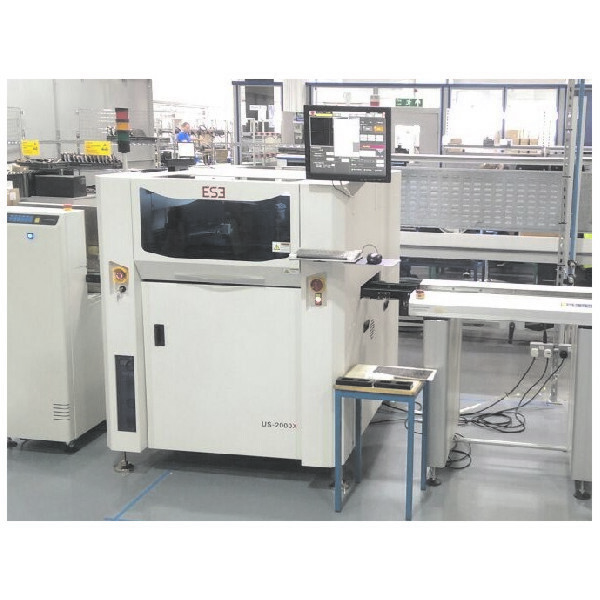 Accuracy and long term printer reliability and operating costs, the smart table design of the ESE has 4 lead scrrews to lift it, unlike others which have 1, maybe two and often offset from the centre, over time print repeatability becomes and issue whereas the ESE printer does not. Z Clamp, to cover the top of the PCB, sometimes known asa snugger, this then goes back down so that the complete PCB surface is in full contact with the stencil. Side clamp, used to clamp the PCB in place. Vacuum Clamping, used to vacuum the pcb down to a fixed level, especially useful for warped PCB's, thin or flexi circuits.